Travel is one of the great joys of my life. 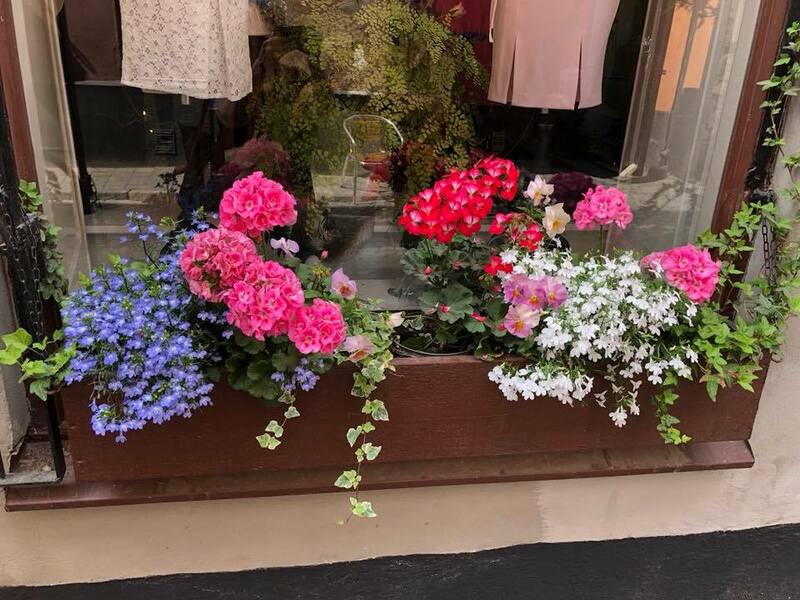 Exploring new countries, learning their history and culture, meeting their citizens...shopping their stores...and, of course, capturing it all with my ever-present camera. It would be hard to overstate just how much happiness it brings me. 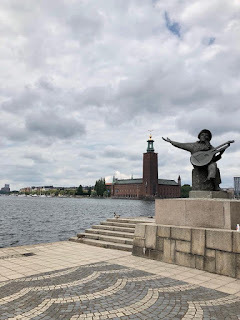 This year, my destination was Sweden, a country I'd never visited and didn't know much about but I was eager to learn. 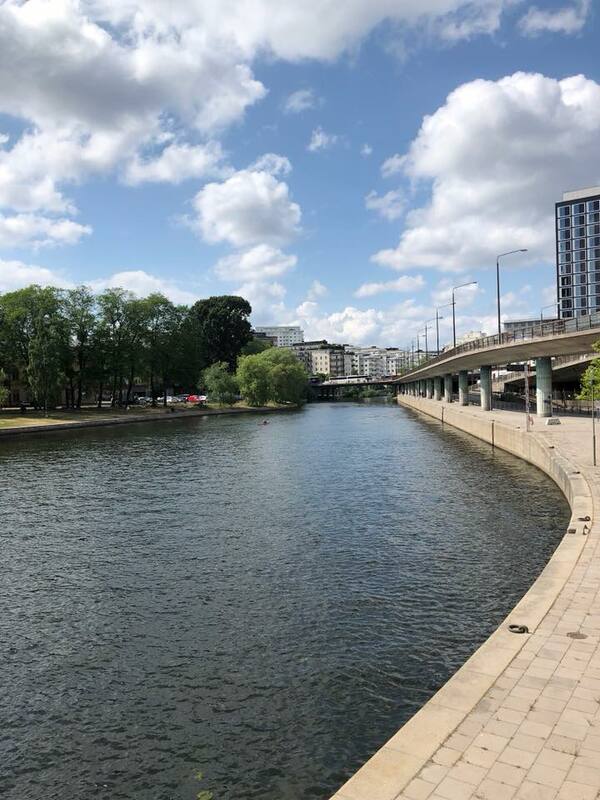 I was especially eager to visit Sweden as it's now the home of my niece and her family. I was there for three weeks last month and each moment was filled with the most wonderful experiences. Here are a few highlights from my first week. Opened in 1923, City Hall is without doubt the most iconic symbol of the city of Stockholm. 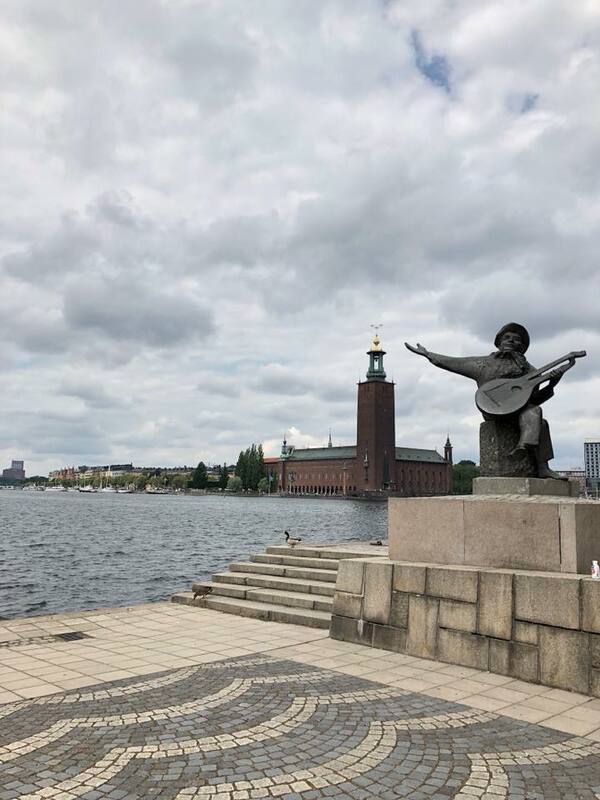 It's tower can be seen from a vast distance and its nearly eight million bricks are a stunning contrast to the beautiful blue waters of Lake Mälaren. The inside of the building is just as impressive, including the city council chambers, the opulent Gold Room, and the Blue Room (which isn't actually blue) where the Nobel Prize ceremony and reception is held. The ceiling panels are painted with actual scenes of local areas to symbolize the openness of the government. The design of the ceiling signifies that decisions made in chambers flow up and out of the building to all residents of Stockholm. 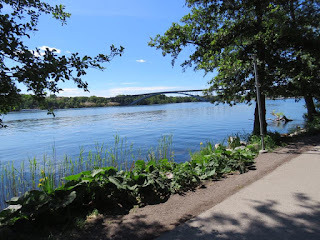 Stockholm is made up of a series of islands, mostly connected by bridges. Though they certainly have their fair share of vehicle traffic, they've also designed their city for the ease of pedestrians. Everywhere, you'll find sidewalks, benches, footbridges, bicycle lanes, and beautiful views. Swedes love to be outdoors! They walk, run, bike, engage in watersports; they're a very active society. They are also a very family-centric society with plenty of parks and other areas for family fun. Also, in Sweden, each parent receives individual maternity leave after the birth of a child so you see lots of dads pushing strollers throughout the city, biking with a child in a seat behind them, doing the grocery shopping, dropping children off at preschool, etc. Both moms and dads seem to be very active and hands-on in the raising of children. Swedes also love their dogs. You see them everywhere: in stores, at cafes, on the buses. They seem to be very well-trained. At least, I never saw one misbehave and I saw a lot of dogs. If you're unable - or unwilling - to walk the city, they have a clean, safe, and efficient public transportation system including buses, trams, and the metro that will easily transport you to your desired destination. Canals, walkways, and bike paths wind through the city. If you have a child in a stroller, you ride the bus free and the bus has an open area designed for strollers with pull-down seats for the pusher. More on the metro stations later because they are an amazingly delightful surprise! Gamla Stan, which dates back to the 13th century, is Stockholm's old town. Honestly, I could have spent my entire visit exploring its winding alleyways and historic buildings. Today, it's filled with shops, cafes, and the like but it only takes a few turns to steer you away from commercialism and into a quiet corner where you can easily imagine you've stepped back into the 1600s. Walking ancient streets with my grandniece. 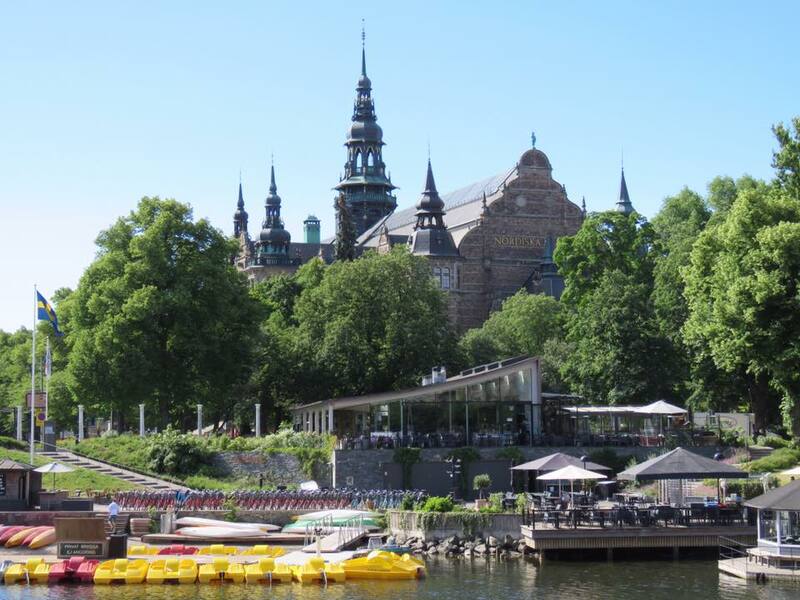 Gamla Stan is also the home of the Nobel Museum as well as the Royal Palace, the primary home of Sweden's royal family. I didn't see any of the royals though I did see their motorcade one day (a ton of security to drive them two blocks for an official event) and we caught the military band that accompanies the daily changing of the guard a few times. Stockholm is a very clean and colorful city. 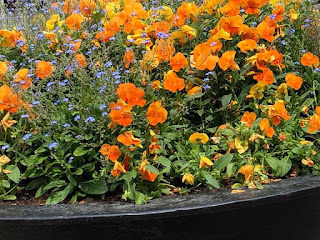 Flowers are everywhere and it's evident art is much appreciated. 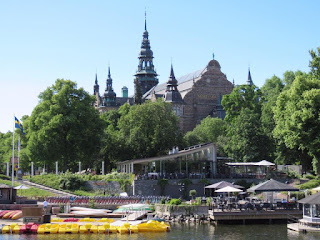 The island of Djurgården (which means the royal game park) in Stockholm is home to a variety of museums, including the Abba Museum, the Nordic Museum, The Vasa Museum, Skansen (an open-air museum) and an amusement park. It's also home to beautiful parks, tree-lined walking trails, and Michelin star restaurants. I could have spent all day strolling through the park below. 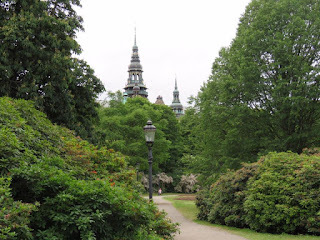 That's one of the towers of the Nordic Museum in the background. And here's the same museum from another view. 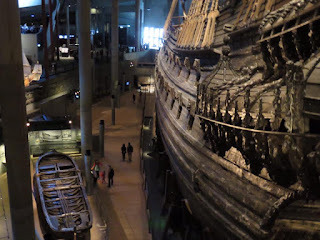 One of the highlights of my first week in Sweden was a trip to the Vasa Museum. 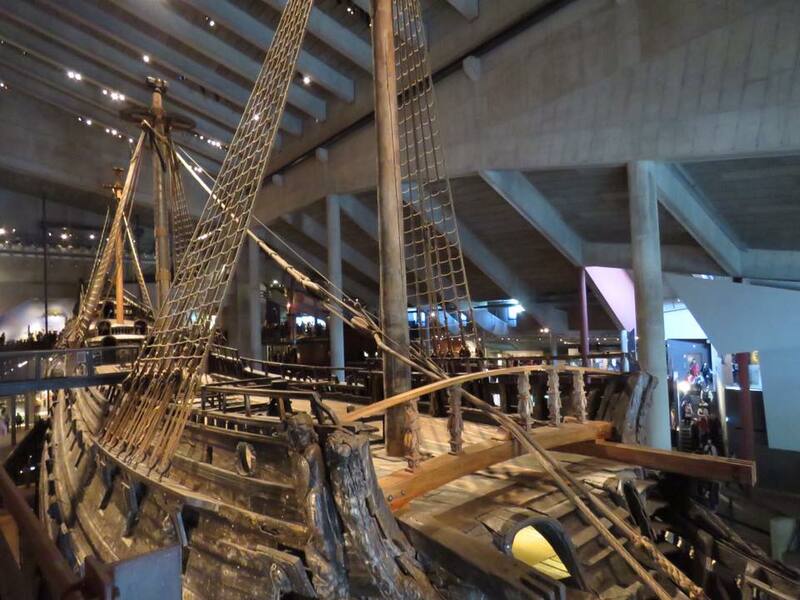 The Vasa was a Swedish warship built in the 1600s. At the time, it was the largest warship in the world and it's a masterpiece. Unfortunately, it was a doomed masterpiece due to its architecture being too top-heavy. 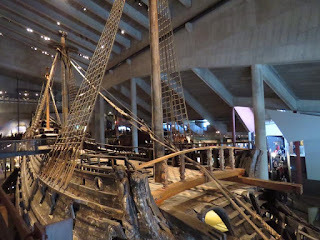 The ship foundered and sank in the Baltic Sea, less than a mile from shore, on its maiden voyage August 10, 1628. Vasa photo taken from halfway between hull and top deck. Many of the ship's bronze cannons were salvaged in the 17th century but after that the ship seemed to be forgotten until it was re-discovered in the 1950s. Incredibly, after 333 years under water, the mostly intact ship was brought to the surface in 1961 and restored. Looking down onto the top deck. 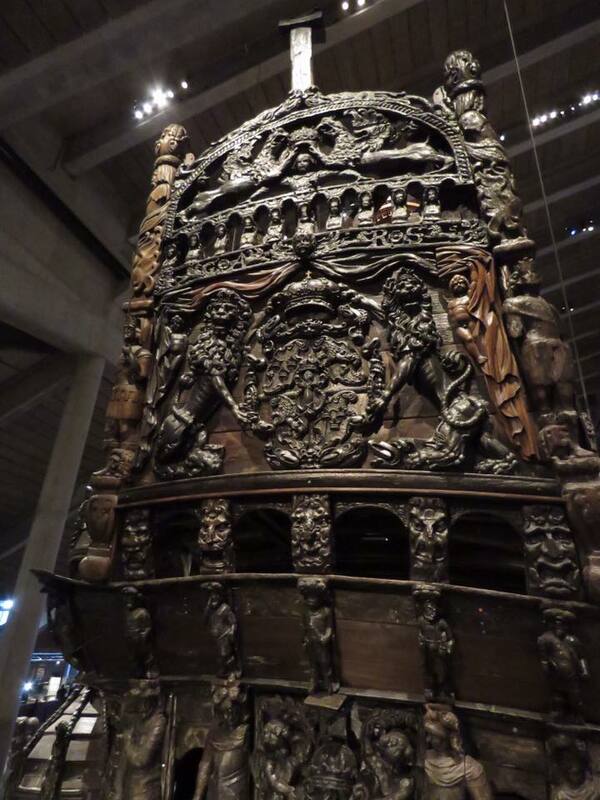 It sits in a cradle at the Vasa Museum and, I have to say, standing next to it was one of the most incredible experiences of my life. 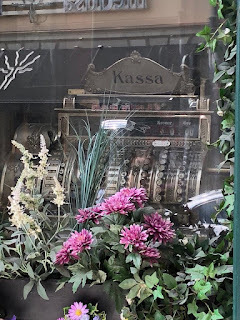 If you ever travel to Stockholm, this is an experience you do not want to miss. 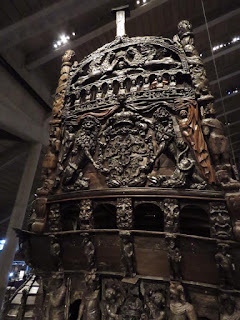 The carvings on the ship are incredible. 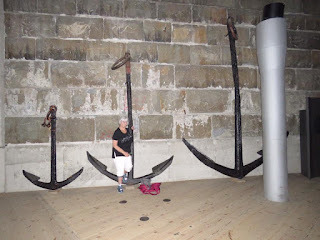 That ship had some big anchors! I couldn't wrap up my first week in Sweden without a look at food. Of course, staying with my niece, I already knew I'd be treated to delicious meals. 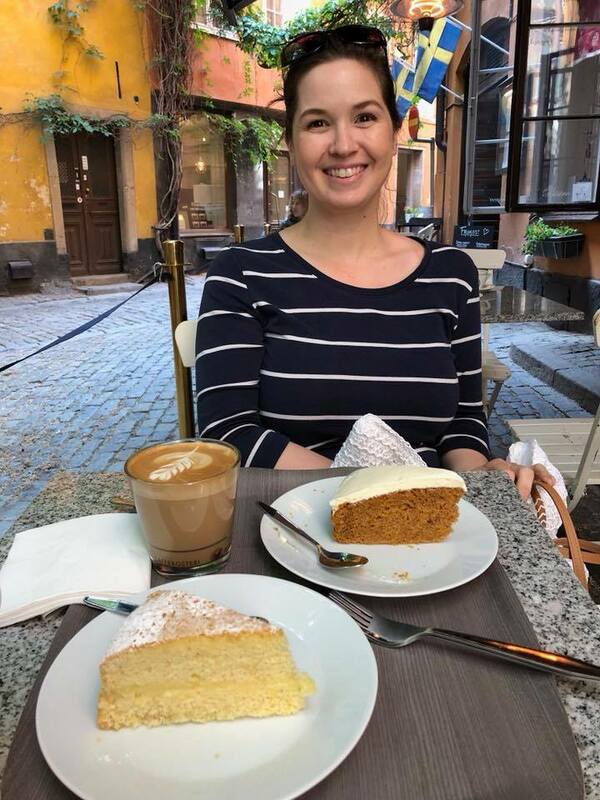 She's a wonderful cook and baker and has had a year in Stockholm to experiment with local cuisine. Swedish Pancakes with fresh strawberries to welcome me. 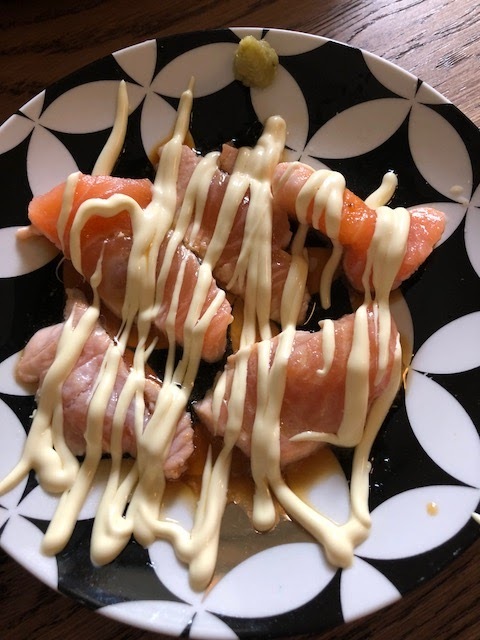 Add to that the fact that her husband (who is Japanese) is a whiz in the kitchen when it comes to Asian cuisine and...well, let's just say I wasn't worried about going hungry. I fell in love with a little cafe on a quiet street in Gamla Stan that has a surprisingly diverse selection of gluten-free pastries. Here's my niece with our breakfast selections: lemon cake and carrot cake. They were delicious! 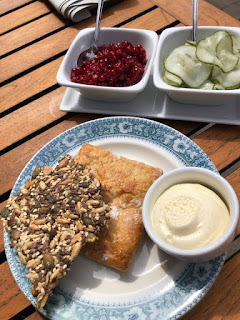 My gluten-free breads plus the pickled cucumbers and lingonberry sauce. So good! 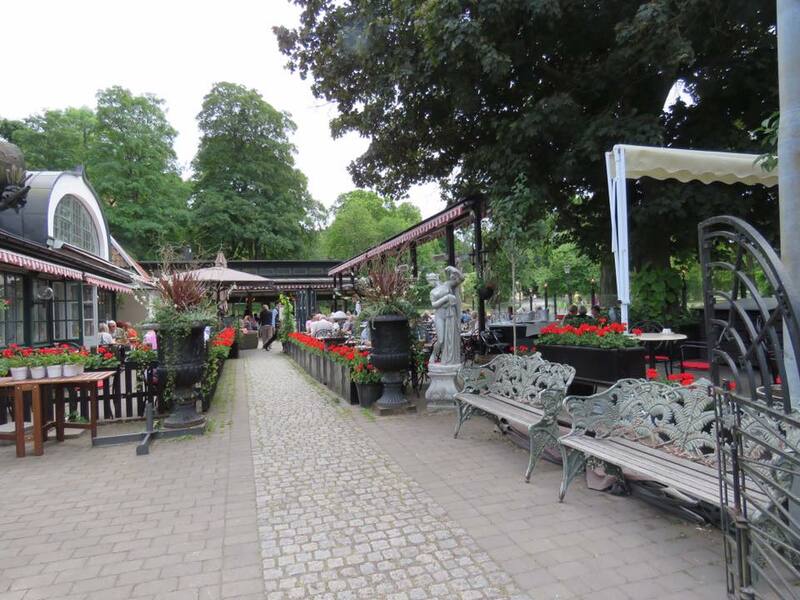 And here's a photo of the outdoor seating entrance at the restaurant. I liked it so much we went twice! It's a good thing we did so much walking because it would not be an understatement to say that I ate my way through Sweden. Here's the beef carpaccio and caprese salad we shared for lunch one day at an Italian restaurant on Gamla Stan. 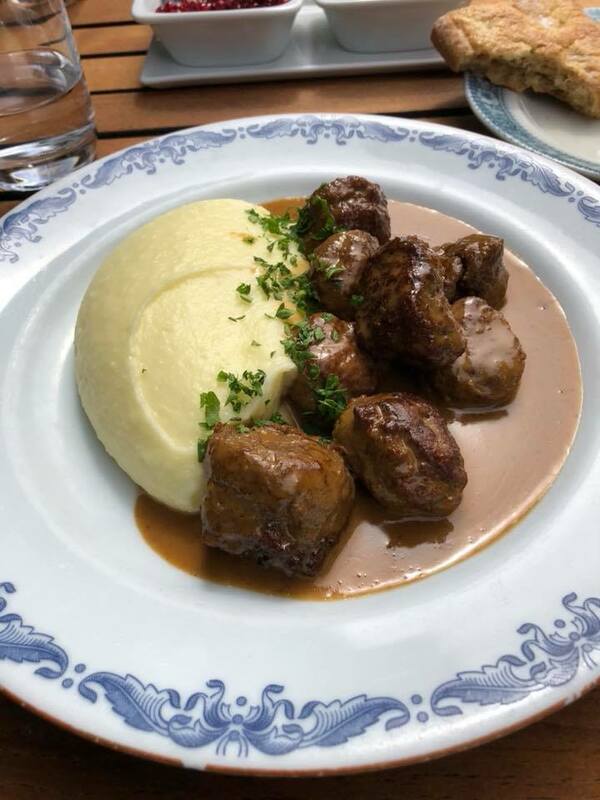 The population of Stockholm is very diverse and that diversity is mirrored in the many wonderful dining options available throughout the city. 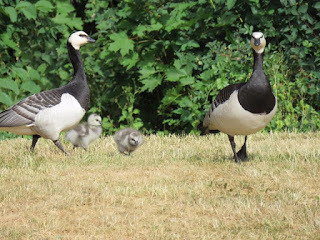 Baby geese were in abundance all over the city. Here's a mama, papa, and babies who were wandering the grounds near the Vasa Museum. That's it for part one of my Swedish adventure. What's on your travel schedule for this summer? Unfortunately, our beach trip is over. I look forward to traveling vicariously through your (and others) trips! Great pictures! Hope you had a good time, Amy! Your trip sounds like a dream. So memorable. So far this summer I have been home dog sitting my son's little dog while they are away and helping with other duties with the grandchildren. Maybe in the fall which I would enjoy and love. the beach. I love the beach in the fall. Not as crowded! Thanks for sharing - if you can't go yourself, it's a way of being there (like reading). I've been following on FB and really have enjoyed hearing about it all. We did our traveling when first married (we waited 15 years before starting our family) and I'm so glad we did. I'm glad you've enjoyed following along. How fortunate you were to have a husband who shared the love of travel. I traveled before I married but my husband didn't enjoy it so travel went on a hiatus for 25 years. I'm grateful I was healthy enough to pick it back up 13 years ago. I really enjoyed your pictures and commentary here and on Facebook. Stockholm looks amazing. My maternal grandparents immigrated from Sweden. My husband and I are taking a tour of Sweden, Denmark, and Norway next summer. I am so excited. We aren't taking a big trip this summer, but in the fall we are taking 2 trips. One to Boston to visit our son and his wife and then a tour of sights in the American West. I'm so excited for you, Cheryl! I can't speak for Norway or Denmark but I absolutely adored Sweden. I'd go back in a heartbeat. 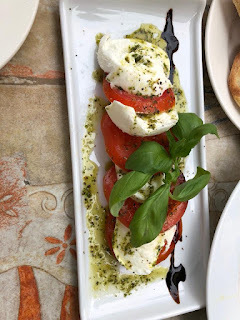 Thanks for sharing wonderful photos of scenery and yummy food - we are on vaca in Colorado. Hope you aren't anywhere near the fires! I've already been on my hols, but we're going up to Orlando next month for my Granddaughter's graduation from college. Thanks for the wonderful pics, etc. I'm a huge fan of Sweden, especially the group, ABBA and was lucky enough to see them in concert back in the late 70's. Stockholm is very proud of them. Their music is played everywhere! Thank you, PJ. BTW, ABBA is releasing a new song later on this year. This will be their first one in decades. Your enjoyment and the vacation is beautiful. I hope that we will be able to enjoy a relaxation vacation at the beach which I look forward to. Hope you're able to make it there! What a wonderful trip! Thanks for sharing. Our next big trip will come in the fall--a trans-Atlantic cruise from England to Miami. Loved your pictures and commentary. Sweden looks beautiful through your eyes. I'm looking forward to visiting Oregon in August and Italy in October. I know you visited Italy last year. October is a great time of year to visit Italy! Have you been there before? What parts of the country will you be visiting? Thanks for the pictures. It looks like you had a wonderful time. Awesome travelogue, PJ. These places you visit should hire you out! Your excitement and enjoyment of the different places you travel to just jumps off the page! No immediate plans to travel due to 2 elderly sick dogs to keep an eye on. I did just get back from visiting my daughter in Minneapolis. That was a nice city. I'm hoping Ireland is in my future - fingers crossed. Thanks, Irish! I've been through those elderly dog days. I didn't want to venture far either. I do hope you make it to Ireland one of these days. No trips this year..my daughter is getting married in October of this year!!!!!! Thanks for the beautiful pictures - it is obvious you had a wonderful time. It’s a toss up between Colorado because it’s the home of the Rockies and that is on my bucket list and the island of Jamaica in the Caribbean! The Rockies are magnificent! We stopped in Jamaica during a cruise several years ago. It was so lush and colorful! 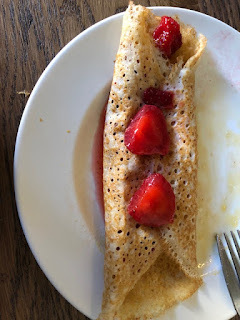 Love Swedish pancakes. Love Lingonberries, have to have them at Thanksgiving. Yes, I'm a little bit Swedish! The most Swedish part of my is my first name, though. What a treat to get to spend that concentrated time to really learn about a place & get to visit with family! I'll be spending a week at the North Carolina beach with family in August - hopefully not hurricanes will visit! Thanks for the chance to armchair travel. Since I live in North Carolina, I'll be wishing for no hurricanes too. Hope you enjoy the beach! Already did it but never know might get to visit some other place this summer. 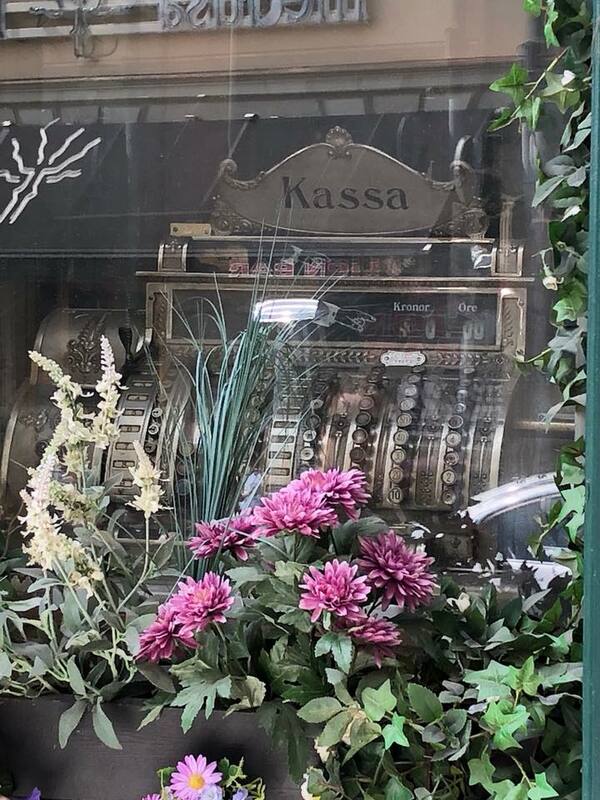 I learned a lot about Stockholm today. Thanks PJ! Sweden is on my list of places I want to visit. Unfortunately I am not doing any travelling this summer. We went to the beach a couple of weeks ago. We are going to Bristol to the race in August! visiting relatives in Tennessee and taking kid to college in Alabama--does that count as a vacation? I don't have any traveling plans this summer but looking at your pictures makes me want to visit Sweden soon. To be honest with you, I always thought it was a cold country but I guess they also have Summers, ha! Sweden is definitely on my bucket list. Don't have plans to travel for vacation this year, but hopefully we'll go somewhere next year. No plans, just some day or weekend trips, did take me daughter to Hersey Pk and a concert. I have a cruise planned soon with friends. Your photos are absolutely breathtaking and the food looks yummy. I will be going on a cruise soon with friends. 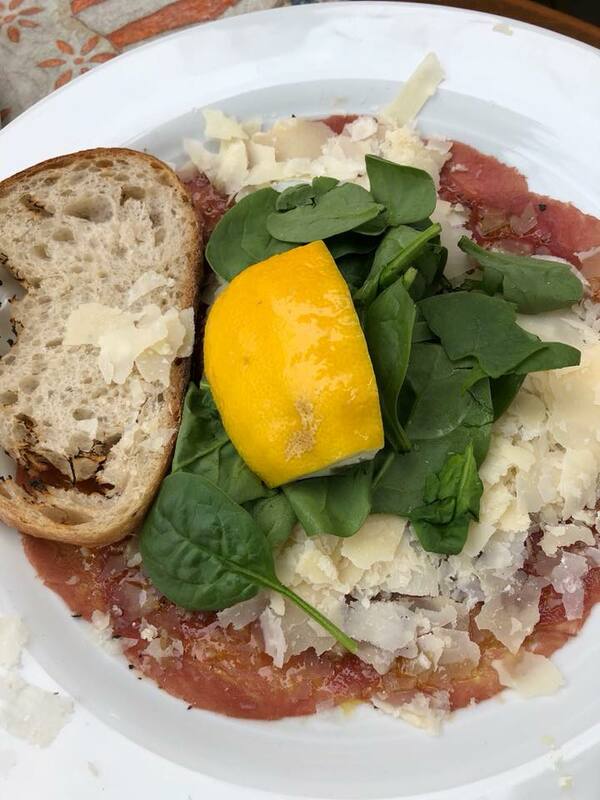 Your pictures are breathtaking and the food looks absolutely delicious.